Chandler 4 Corners asks wholesale customers to go online and take a brief survey in order to let the company know what tools it can provide to clarify the Chandler brand in stores. In a recent newsletter to retail partners, Chandler 4 Corners asks shop owners to “take 2 minutes to tell us how we can help.” As a manufacturer and distributor of high-end, hooked wool throw pillows, rugs, and accent furniture, Chandler 4 Corners feels it is a priority to hear from those on the “front line” of customer service. All Chandler 4 Corners wholesale customers are urged to log-in and complete the survey before the end of May. If you are not a C4C wholesale customer, visit the website to learn more about how this established brand might work in your store. Chandler 4 Corners has been offering pillows, rugs and household accents since 1995. Based in Manchester Center, VT the company sells to retail shops, leading catalogs, and individuals across the country. Chandler 4 Corners hand-hooked products are made of pure wool in natural colorways that suit any home decor. 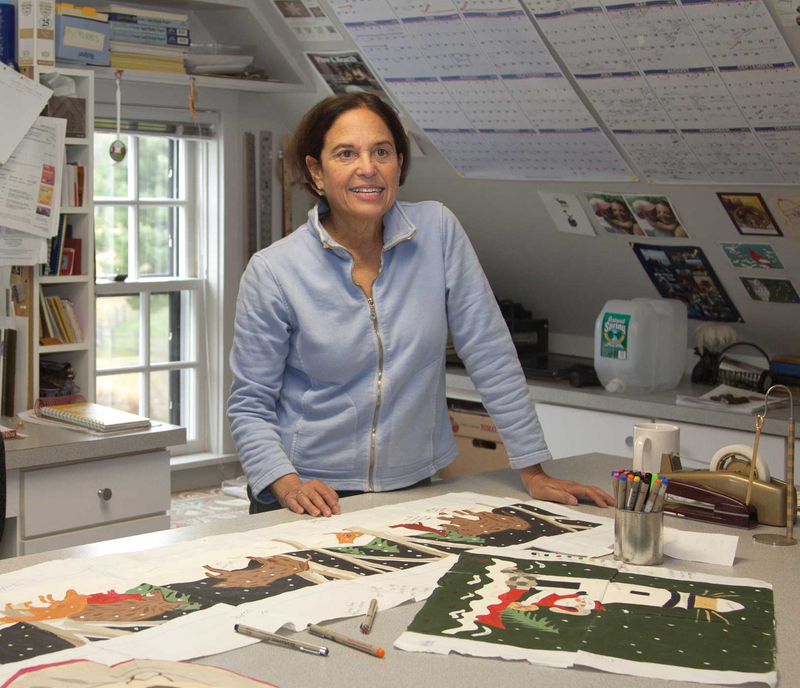 Designer Laura Megroz in her Vermont studio.